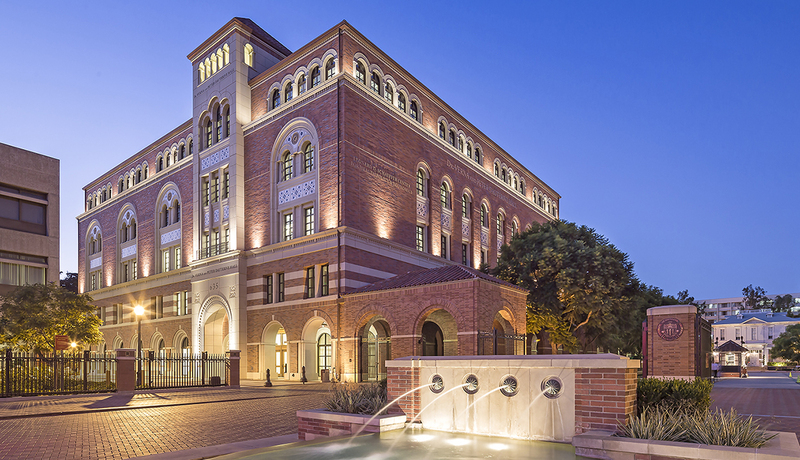 Verna & Peter Dauterive Hall is an office and classroom facility located on USC’s University Park Campus, designed to house flexible spaces for interdisciplinary social sciences research. The five-story building with one basement level is constructed of structural steel moment-frames and metal decks with concrete fill. Key elements of this facility include a large central atrium to promote visual connectivity throughout the building, multi-purpose collaboration areas, dry lab research space, classrooms, meeting space, research modules for interdisciplinary institutes, administrative areas and related support spaces. The exterior façade is a beautiful example of the architectural style of the campus, with a tripartite brick and precast concrete facade, mosaic tile inset panels, detailed archways, recessed windows framed by columns and clay tile roof. The interior expresses a more contemporary aesthetic, utilizing glass and wood finishes.